Our city is in a little bit of a frenzy right now – people are dancing in the streets – literally. I have to admit that even I have a little Seahawk’s fever. I think today was the first football game I ever sat through beginning to end. I really wanted the Seahawks to win – for the kids. They were all dressed up, made signs to cheer them on – even my younger daughter wore a sign around her neck all day with the number “12” on it. Yes, we were all the twelfth man tonight, and it paid off. Normally the Super Bowl is a day for me to make lots of fun snacks, and to spend the day in the kitchen. Of course, nothing like my friend Kristy and her husband Mike over at Eat, Play, Love. You should check out what they did today – extremely impressive. 11 hours in the kitchen for their annual Chopped Challenge! What a fun way to spend a Sunday. Our friends were hosting today, and they assigned us all different snacks to bring. Mine was French Onion Dip and potato chips. Yesterday my younger daughter was bored – so I let her make the dip all by herself. She was very proud, even though all she did was take a package of Lipton Onion Soup and mix it with some Sour Cream. Hey – everyone starts somewhere right? I decided to bring a couple of extras – one being this Nacho Vidal. When I saw the recipe in Bon Appetit for the shrub – I got very excited. I have been wanting to make a drinking vinegar for some time now. My husband cannot stand the smell of vinegar, so I waited until he was out of the house to try this one. The drink came together beautifully – it was a cross between a Nigroni and a Margarita. It was not too sweet, and you could not tell at all that you were drinking vinegar. I absolutely loved it – and my neighbor said it was one of the best drinks I have ever served. Score!! If you do not drink alcohol, or you would like to make this for kids – you can easily enjoy this drink without the Tequila and Campari. Just mix everything else together with 1 1/2 cups of Pomegranate juice and 2 cups of sparkling water – no shaking necessary. It will be a nice refreshing treat. Here’s to the Seahawks!! Bring all ingredients to a boil in a medium saucepan. Reduce heat; simmer until slightly reduced, 8–10 minutes. Let cool, then strain into a jar. Cover and chill. 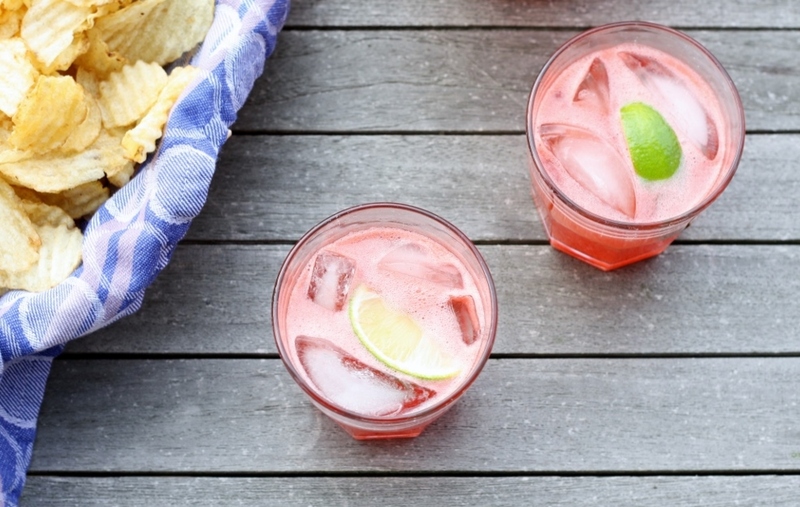 Combine tequila, Campari, lemon juice, lime juice, and shrub in a large pitcher. Place 1½ cups tequila mixture in a cocktail shaker; fill with ice. Shake until frosty, about 30 seconds. Divide between 2 rocks glasses filled with ice; garnish each with a lime wedge. Repeat 3 more times. Do Ahead: Tequila mixture can be made 6 hours ahead. Cover and chill. Love me a good shrub! These look delicious! This looks like a fun and refreshing drink. I guess drinking/consuming apple cider vinegar is supposed to be good for your health so you have that going for you too. Thank you for the shout-out Dawn. :) We had a great time as you know. Congrats on the Seahawks win. It worked out rather nicely for me too as I won the office pool (which I’ve not played until this year!). Beginner’s luck I guess. I’m so intrigued by this drink. I love vinegar!!! I’m definitely going to have to try this one out.